Science Series: Dr Darrell Green says : "Donate to a local charity with a world changing vision like Big C"
Next up in our science series – we’ve been talking to Dr Darrell Green, a Senior Research Associate at the University of East Anglia who is soon to take up the position of Lecturer in Medicine at the University, about the work he is undertaking in childhood bone cancer and about one very important piece of equipment that will help him to continue making new discoveries. Donating to a local charity with a world changing vision like Big C, means you can see with your own eyes the specific research projects and patient care that is taking place right here in Norfolk, and that’s thanks to your generosity. Next up in our science series – we’ve been talking to Dr Darrell Green about the work he is undertaking in childhood bone cancer and about one very important piece of equipment that will help him to continue making new discoveries. Darrell lost his friend Ben Morley at High School to a rare form of bone cancer called Ewing sarcoma age 13. Seeing what Ben went through made Darrell determined to help understand and find a cure for childhood bone cancers, such as Ewing and osteosarcoma. Big C funded Darrell’s PhD in molecular biology at the University of East Anglia (UEA) and, today, he conducts research into metastasis, which is how cancer cells learn how to spread and develop into secondary tumours elsewhere around the body. Darrell is extremely passionate about his work into bone cancer and says: “For over 30 years treatment for bone cancer hasn’t changed. Last year, partners of the National Cancer Research Institute spent £683 million on cancer research but only £430,000 of that was for bone cancer – down 3% from the previous year. “Most cancer research focuses on the primary tumour and the site at which it first appears. However, secondary tumours elsewhere are the main culprit for a patient’s treatment failure. “We used to think that it took a period of time for the cancer cells to learn how to spread but we and others have recently seen that spread happens much earlier than we first thought. “Both tumours evolve independently and respond differently to treatment. In my friend Ben’s case, his primary tumour was removed by surgery but it was the secondary tumour in the lung that was ultimately responsible for his death. To help Darrell continue with his research, Big C have recently part funded a crucial piece of equipment that will be of benefit across the Norwich Research Park. The ClearCell FX System isolates cancer cells that have been shed into the blood from tumours. Molecular analysis of these specific cells provides a much more relevant picture of the patient’s primary and secondary tumours. Darrell says: “This piece of equipment is far superior to closely related technologies. We are studying circulating tumour cells in a way we couldn’t before. “There’s only two of these machines in the UK – one in Manchester and now one in Norwich. I hope we manage to lead the way on cancer metastasis, especially in bone tumours”. The new system will be available to all cancer researchers on the Norwich Research Park and Darrell says he hopes other cancer research groups benefit from the system being purchased, not only in individual cases but for larger scale clinical trials, where patient response to treatment can be monitored with a simple blood draw. Darrell adds: “I simply wouldn’t be where I am today without Big C or the mentorship of my PhD supervisor, Professor Bill Fraser. 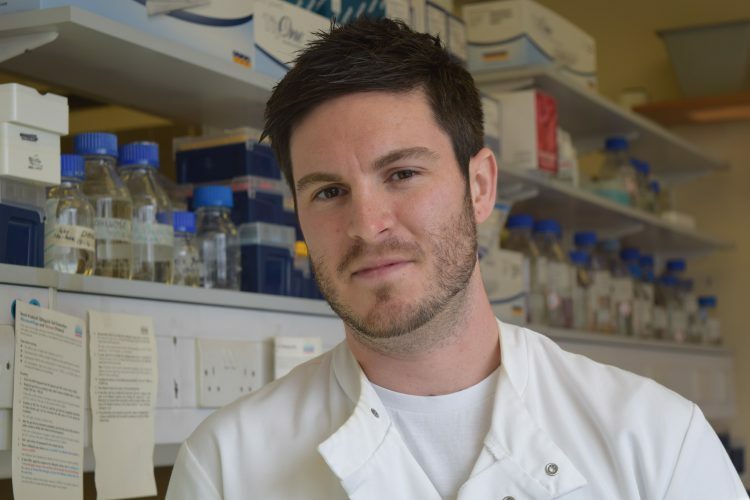 “The work from my PhD is ongoing and we have discovered some extraordinary mechanisms that cancer uses to survive. Without further commitment from Big C in helping to purchase the new equipment, the work into cancer metastasis would not be taking place. “Throughout the funding process, Big C understood the impact our work could eventually have and the powerful part this new equipment will play in that. We have already made significant steps forward using the equipment and in a few week’s time we will have detailed molecular data on circulating tumour cells. “I want to personally thank everyone that donates to Big C. I really hope you see the money you donate actively makes a difference. Often if you donate to a larger charity, it feels like your money disappears into a black box and you never really know what it paid for.